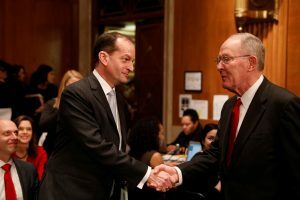 WASHINGTON — The Senate has moved President Donald Trump’s pick for labor secretary one step closer to confirmation. By a 61-39 vote, senators on Wednesday cleared Alexander Acosta’s nomination for a final up-or-down vote later in the week. He would become Trump’s only Hispanic Cabinet member. The process for filling the job was not smooth. Trump nominated Acosta only after his original pick, Andrew Puzder, withdrew his name. Puzder, former head of a fast food empire, acknowledged having hired a housekeeper who was not authorized to work in the U.S. Democrats and labor leaders challenged his ability to advocate for American workers. The Senate has previously confirmed Acosta three times to posts at the Labor and Justice Departments.